Power Rangers HyperForce is set in the year 3016 at Time Force Academy. while running into many familiar eras (and faces) along the way. 1 October 24, 2017 "Welcome to Time Force Academy"
2 October 31, 2017 "It's Morphin Time!" 3 November 7, 2017 "Whatever Happened to Scorpina?" 4 November 14, 2017 "Aisha Campbell Returns!" 5 November 21, 2017 "We Need Megazord Power!" 6 November 28, 2017 "Vesper's Betrayal"
7 December 12, 2017 "It's Boom Time"
8 December 19, 2017 "Holiday Special"
9 January 2, 2018 "Dr. Tommy Oliver Returns!" 10 January 9, 2018 "Family"
11 January 16, 2018 "A Ranger in King Arthur's Court"
12 January 23, 2018 "Save Marv"
13 January 30, 2018 "What Happened to Rita Repulsa"
14 February 6, 2018 "SPD Emergency"
15 February 13, 2018 "Absorption"
16 February 20, 2018 "Homecoming"
17 February 27, 2018 "Director Ransik"
18 March 6, 2018 "Stage 4: The Armada"
19 March 13, 2018 "Shattered Grid, Part 1"
20 March 20, 2018 "Shattered Grid, Part 2"
22 April 3, 2018 "Fight for the Corona Aurora"
23 April 10, 2018 "Rebirth… Kind Of"
24 April 17, 2018 "Finale, Part 1"
25 April 24, 2018 "Finale, Part 2"
* October 24, 2017 Andre Black Nerd: I'M THE NEW BLUE RANGER! with Peter Sudarso and Andre Meadows! with Strawburry17 and Cristina Vee! 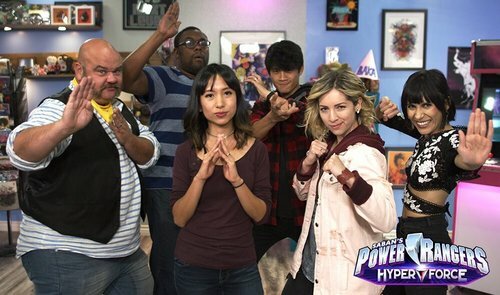 11 March 23, 2018 Game Master Malika Lim Explains the Power Rangers RPG System!